There are some pieces of history that are better left in the past…because they carry a dark energy of a time we were much less evolved. Salem is one of those. It was a time of religious ignorance and closed-mindedness….and many innocent, mostly women, were tortured, persecuted, and brutally killed. Pentacle, 5-pointed star, sacred symbol representing natural elements of Earth, Air, Fire, Water, and Spirit, with ourselves and the divine in the center. There is nothing more dangerous and destructive or bloody than acts committed in the name of religion…Christian religions in particular. The Wiccan religion ‘witches’ leave no such blood bath in their wake. Hollywood witch portrayals are equally ignorant. Satanism is not part of the Wiccan religion. 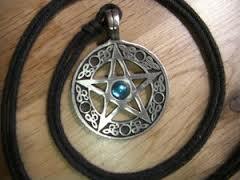 There is no such being in the Wiccan religion; only the Christian traditions…again. There are pot-stirrers around, those who deliberately trade in fear and dark energies. You know them, feel them, recognize them, because anytime you’re around them or listening to them, you feel anxious or afraid. They promote an ‘us versus them’ attitude, with ‘them’ being somehow evil and ones to be feared. Words and people have been demonized–out of ignorance or arrogance–and neither is attractive or inspiring to our spirit. We live in a time of much more awareness and diversity…and our consciousness is expanding. Let’s not go backwards. … Actually we can’t. Once an egg has hatched, a chick will grow–and will you believe you’re an ugly duckling? or know, trust, you’re a powerful eagle or gorgeous, graceful swan? If you want inner peace and grace, avoid dark-energy programming. Turn the channel, do something else that brings you joy and delight, play, read; perhaps with others like you. How do you want to feel? What thoughts do you want playing around your head? Whatever we put our attention on is the direction we are moving toward. And we get to choose that. Whatever we put our attention on will direct the feelings and emotions we will experience. That’s inspiring and empowering! What natural highs do you want to feel? Choose shows of light energy, organizations that trade in love and light, companions and activities that support your happiness and joy. All religion is not spiritual; and a lot of what’s spiritual is outside buildings and institutions. Let’s look forward to more light and continue today’s great spiritual growth and consciously evolving momentum–not only for ourselves; for children also. To all adults: Take your role as caretakers of the children very seriously, for it is imbued with Heaven’s blessings … The children especially need and require extra shepherding at this confusing time on the planet.